3 extents of St Simon's and 7½ extents of Plain Bob. Rung half-muffled at 11.02am for Remembrance. First as cover for Yuhan. First in mixed doubles for Chris. First as conductor in mixed doubles for 5. This performance is linked to the events Let's Ring! 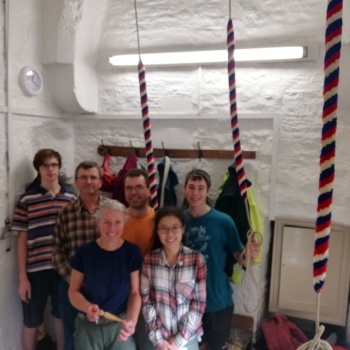 — Peals and Quarters, Ringing for the Centenary of the WWI Armistice and Gloucester & Bristol Diocesan Association — WUE Branch 2018. L-R in no particular order. With guest appearance by the spike. Last updated Monday, 12 November 2018 at 16:29:52. First submitted Sunday, 11 November 2018 at 12:27:19 by Alistair White-Horne. Sent for publication in The Ringing World on Thursday, 15 November 2018 at 23:25:47.